Why is an ‘observer’ quietly scribbling in the corner of Wilf and Connie Craven’s room? And what are the secrets which threaten to bring the Cravens’ house down around their ears? Seeing is believing? To what extent can an act of observation bring out reality? 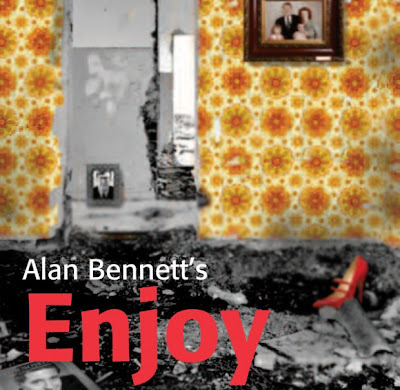 ‘I want to see you, seeing her, seeing me’ says one of the characters in Alan Bennett’s 1980 play, Enjoy. The main characters in this story are an elderly couple in their soon-to-be demolished back-to-back in Leeds. When the play begins, Wilf and Connie Craven are bickering like many couples would do, but they soon invite an stranger into their home. This person has come for a peculiar purpose - to observe them. Filled with hilarity and absurdity, the fine new production of the rarely performed play is co-directed by Damian Cruden and Juliet Forster at York Theatre Royal. One of the most interesting themes dealt with in this play is voyeurism, which the playwright experiments with a great deal. The directors never let us forget that strangeness and disturbance come with the act of observing. Yet, who are we to judge this behaviour when we, the audience, are all sat watching too? Layers of bizarreness and irony juxtapose Bennett’s intriguing narration as the play goes on. Disturbing, yet it seems entertaining too. This production highlights the tensions within the play between celebrating the new and lamenting the old. An appreciation of Bennett’s theatrical delicacies is clearly shown. It being rather faithful to the script, the production is a well balanced piece, allowing space for members of the audience to decide for themselves how they prefer to see the confrontations between the old and the new, and other dilemmas concerning family values, class and sexual orientation. Connie Craven, or Mam (Gilly Tompkins), carries the distinctive emotional texture of a mother. Her forgetfulness, as a symptom of ageing, is both pitiable and funny, but at the same time she shows strength in adapting herself to circumstances. She seems to struggle less than her husband in situations where they are forced to move out and where their children do not behave as they expect. Tompkins’ performance presents a mother character that is believable and emotive. There are hints that Mam is willing to be a self-deceiver rather than being just a simpleton clinging to the past and fooled by her children in disguise. In contrast to Mam, the other characters in this production appear slightly flat. Dad (Peter Nolan) is bad-tempered whenever confrontations occur. Linda (Katerine Dow Blyton), and Ms. Craig (Alex Scott Fairley) are both a bit confined to stereotypes. At times they are portrayed with exaggeration and overstatement, which adds more ridicule and some dramatic effect (for example, in the death scene). However, this perhaps also reduces dynamics in some scenes and unfortunately removes the possibilities of alternative understandings, which Bennett’s text could have promised. This is quite an interesting remark. The thoughtful ones in the auditorium can go ahead and wonder whether the characters are enduring having a creepy observer or to a certain extent secretly enjoying it. And it might be likely that Dad enjoys Mam’s forgetfulness after a period of endurance. The York production does not always allow such possibilities to exist, though.